Paul, the German octopus famous for correctly predicting each of Germany's 2010 World Cup matches, got his own permanent memorial three months after his death on Thursday. 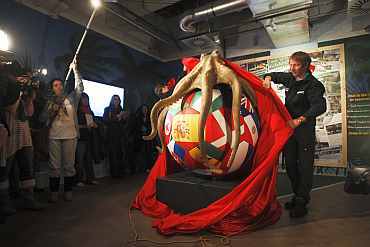 The Sea Life aquarium in Oberhausen, Germany, unveiled the 2- metre tall plastic replica of Paul clutching a football in its eight arms on Thursday.
" 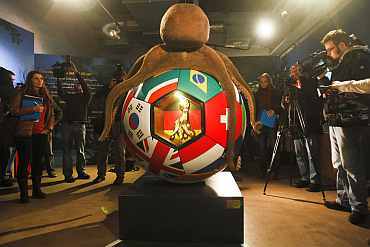 The cephalopod's cremated ashes were placed in a gold-leaf-covered urn inside the football," aquarium spokeswoman Tanja Munzig said. Dubbed "Paul's Corner," the centerpiece of the memorial will be the octopus oracle's urn. Paul died aged in October last year. Fans around the world had asked for a memorial. "We acted upon the wishes of fans and created a place of remembrance," Munzig added. He became an international sensation this summer after he correctly predicted each of Germany's World Cup matches -- including their two losses. Paul also correctly tipped Spain to defeat Netherlands in the final. 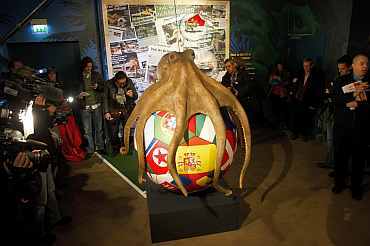 During the height of Paul's popularity, scores of reporters and photographers crowded around the octopus' tank when he made his predictions. The picks were also broadcast on live television in Germany and across parts of Europe. The mystic mollusc would foresee the winner of the soccer match by choosing a mussel from two transparent boxes adorned with the competitors' flags. The mussel from the box that Paul chose was considered his prediction. The oversized football that the immortalised Paul sits on is covered with different national flags and also has a small window through which visitors can look at the urn. In addition, the aquarium created a so- called " Paul Corner" which includes newspaper clippings in many different languages that tell of Paul's global fame and exhibits gifts sent to the museum.